It is always best to buy from the dealer that is specializing in bonsai, because they know what trees are suited for the local climate and how to take care of them. Trained staff provides bonsai trees with proper care assuring that you are getting a perfectly healthy tree, unlike department stores and farmers market, where employees know nothing about bonsai. Most of the garden centers sell established bonsai trees, but be careful buying plants that are newly potted and pruned to create an instant bonsai. Avoid buying plant that has torn or damaged leaves. Shrunken and dried buds might be an indicator of incorrect watering. Buds should be well formed and shapely bursting with life and strength. And don’t forget to check for pests and diseases. When purchasing from Internet, make sure you are buying from a reputable bonsai website. Also check their shipping and return policies in case something is wrong with the tree and you want to return it. I think that raising your own bonsai is a lot of fun. You can raise plant from seeds, grafting, cuttings, or air-layering. But keep in mind that you need a little more experience and knowledge to do it the right way and it will take several years before a well established bonsai is formed. It is not very reliable method that requires a great deal of patience. 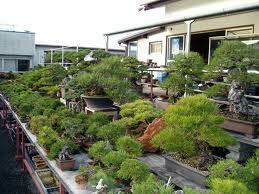 You can get an established plant from the garden center and create your own bonsai tree through pruning. Make sure you are starting with a perfectly healthy plant. I always recommend asking for bonsai care information and recent history, like trees’ origins, last repotting, age and etc. You should avoid buying pre-packaged bonsai kits or bonsai in the display boxes.